Jardins admits, however, "I still feel like a humble cook." Case in point -- Jardins is still an active member of several non-profit organizations including La Cocina, her favorite charity and the recipient of $30,000 in Top Chef Masters challenge prize money. 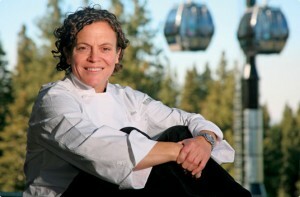 It's a foundation "helping women achieve their food service dreams," she says. Add to that her extensive work with Nextcourse when she's not busy in the kitchen, along with hunger-relief organizations Citymeals-On-Wheels, Share Our Strength, and the Marin Agricultural Land trust, and it's clear Jardins has more on her plate than just gourmet fare. Yet amidst the new uproar of post-series press appearances, she has one new business venture in mind: a new cookbook. This is a first for Jardins; "Oddly enough," she admits. "Seems like it would be a fun project. It has a different kind of pressure to it -- not like working in a restaurant." Might there be a recipe inside for her challenge-winning halibut with brown butter sauce? Possibly. But Jardins says the technique is quite simple. "Just brown butter with a little balsamic vinegar, which has a lot of sugar to help create that emulsification. It's a delicious, quick pan sauce." Based in the culinary hub of San Francisco, Jardins is a James Beard award-winning chef and owner of three restaurants in the City by the Bay -- Jardiniere, Mijita Cocina Mexicana, and Public House -- where diners can sample her French-influenced Californian cuisine.